Having been in the hardware industry since 2002, Legit Reviews has become known as one of the last refuges for un-biased honesty and unquestionable integrity. While revisiting a recent review of a power supply from SkyHawk we noticed a number of things wrong with our model. Unlike many sites, Legit Reviews does not sell the review samples the day after the review is published. We like to continuously use the products to see how they hold up over time. It is a good thing LR operates this way, because the owners of the following SkyHawk power supply model numbers are going to be in for a shock. Take a quick look below… On the front of the box it says “Triple Rails for +12V” and then goes on to say ‘Intel ATX 12V Version 2.0 & EPS 12V Version 2.1″. It turns out from our investigation that the above power supplies do not meet the ATX12V or EPS12V standards as the packaging claims. Power Supplies, like almost anything in life, have set guidelines to follow to be certified. Form Factors is the organization that publishes and provides the specifications that product developers need to follow. The current standard for ATX power supplies it the ATX12V Power Supply Design Guide v2.01. The Revision 2.01 guidelines are aimed at more stable ATX12V power for Intel’s new Prescott CPU architecture and the high end PCI Express graphics cards. Another Guideline is the EPS12V Power Supply Design Guide that is a Server System Infrastructure (SSI) Specification For Entry Chassis Power Supplies. 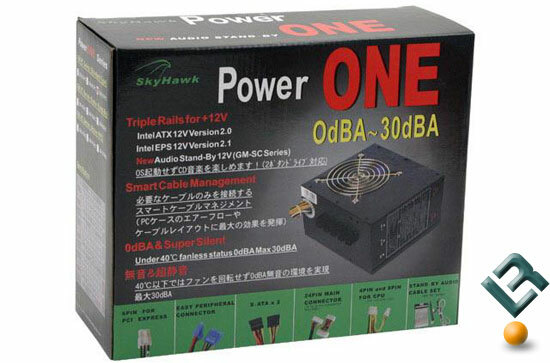 SkyHawk claims the above mentioned power supplies are ATX12V v2.0 and EPS12V 2.1 compliant. After further investigation Legit Reviews has come to the conclusion that the forementioned Power Supplies DO NOT meet the guidelines based from the findings we will show later in the article. The ATX12V v2.01 guide is 44 pages long and the EPS12V v2.1 guide is 31 pages in length, so we shall highlight the areas in the guidelines that we have issues with. System components that use 12V are continuing to increase in power. In cases where expected current requirements is greater than 18A a second 12 V rail should be made available. ATX12V power supplies should be designed to accommodate these increased +12 VDC currents. The 12V rail on the 2 x 2 power connector should be a separate current limited output to meet the requirements of UL and EN 60950. There are two types of 12V rail configurations for systems: ?Common plane? and ?split plane? processor power delivery. The ?common plane? system has both processors powered from a single 12V rail (+12V1) from the power supply. The ?split plane? system has both processors powered from separate 12V rails (+12V1 and +12V2), one dedicated to each processor. The system, in both cases, has an additional 12V rail to power the rest of the baseboard +12V loads and dc/dc converters. +12V1, +12V2, and +12V3 should not be connected together on the baseboard to ensure that 240VA protection circuits in the power supply operate properly. As you can tell from the above three statements it is clear that on power supply units that are going to be using greater than 18A there needs to be multiple 12V rails. It also states in the ATX12V 1.2.4 section that it “should be a separate current limited output” and then on the EPS12V it goes as far to say that all the +12V rails should not be connected together on the baseboard to ensure that 240VA protection circuits in the power supply operate properly. Now when we open one of these SkyHawk Power Supplies that says ATX12V 2.0 and EPS 2.1 on the box we expect it to meet the requirements found in the guide. We know what we are looking for and don’t care about voiding our warranty, so let’s take several power supplies apart and find out what it going on.